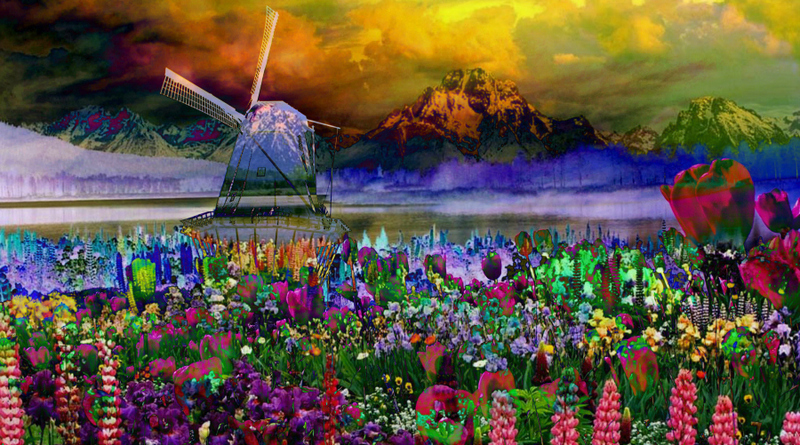 This impressionism landscape with flowers was created for the impressionism series of 2013. I really enjoy making landscapes. I tend to marry some parts of different images. Picking and choosing my overlays based on texture, light, color, structure, movement and a good old-fashioned kick in the gut. Some things are meant to be. This artwork came out of my I want to paint in the impressionism style period. Of course, my tools have nothing to do with the paint or brushes of tradition, I am a digital artist. I appreciate the bazillion choices of color that digital art provides and the brushes seem limitless. 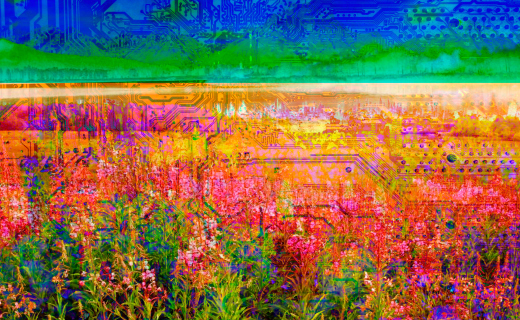 I can meld or combine images after turning them into overlays then combine them with my digital paintings, the options available within each also seem limitless. I love how it feels to begin a digital painting and live with them for a good amount of time I give them their titles, tags, comment and copyright. impressionist landscapes are a familiar pathway now. I have made so many landscapes I could post one a day for 7 years and not show everything I’ve made. Went through a lot of them early on when I was learning, always learning. All day, Impressionism landscapes with flowers, with trees, with hills, with the shine of the sun across a field or the depth of the night in the garden, I made them with love, each one. These days, my impressionism is mostly digital painting over a trimmed, white washed and layered, pieces of digital images, swatches of once upon a time and my own dabs and dollops. I like to lay out the path, enjoy that I understand it and celebrate a set pattern of creation, exposition, adaptation and print. These smaller meant for internet images that I post here in my website or on Flickr, Facebook and Twitter are available to share, please do so with joy. I hope they make your day week month or year a little better, at the very least, different. You can find large format impressionism landscapes with flowers, with trees, with hills.. well, you know the rest. Click the FFA to see my store. To see more of my Impressionism/impressionist art, visit Impressionism Art Gallery. Impressionism landscape of flowers art by Mary Clanahan.